Easy to use and speedy in installation. Their sleeve wedge cones are designed to give maximum expansion even in shallow anchoring depths. Reduced outside sleeve diameter compared to thread size for smaller hole sizes. Offers reduced stress in base masonry materials, concrete. brick, blockwork & stone. The anchors are Zinc Yellow Passivated for increased corrosion resistance. Offer's easier fixture removal or repositioning due to the bolt remaining in the sleeve. Also known as 'Projection Bolt' sleeve anchors. Widely used for fixing balustrades, handrails, racking and holding down machinery, etc. 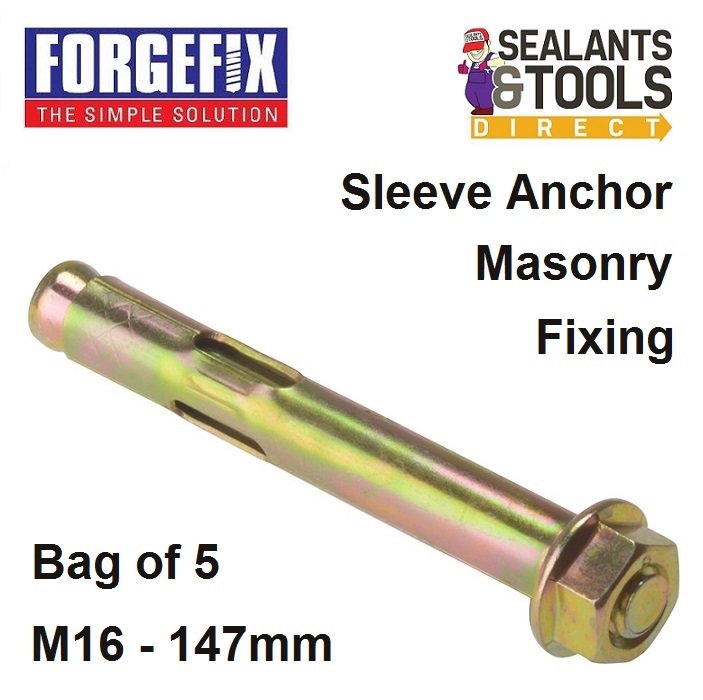 M16 Sleeve anchors should be used with a 16mm masonry bit. 102mm mm maximum thickness of material to be anchored.